Truffles and Twinky when they were much younger...........such ROYALTY! Hello to all of my dear blogging buddies! Today I would like you to meet our two Pixie-Bob cats. Their names are Truffles and Twinky. They are a relatively new breed of cat, that are part barn cat, part bob-cat. They have the most adorable personalities, are very talkative, and are what I call, my "puppercats", because they follow me around the house like little puppies. No matter what room I am in, one of them has to be there with me. They are the sweetest, most loving cats I have ever had. We just celebrated their fourth birthday on Sunday, which consisted of catnip, new toys, and a day out on the patio in their kitty stroller. As you can see in the one solo picture of Twinky, she was sticking her tongue out, looking just thrilled to have her picture taken! Both of them make the funniest faces, and have brought us many good laughs! I find it amazing that animals can sense the littlest bit of sadness or stress we encounter. I remember one day late in late winter I was feeling a bit down about things, and laid down on the couch. Within ten minutes, Twinky was laying right on top of me, and Truffles was curled up under the blanket at my feet. Talk about instant compassion! God gave us pets for so many reasons, and I believe one of them is for this very reason, to help us de-stress. Have any of you had similar experiences with your pets? Do you have any fun pet stories to share? I would love to see pictures of your's and hear about the joy they bring to your life. Even if you don't have any pets, stop by and let the stories of others and their pets, be the much needed stress reliever that you may need today! What adorable little cats! They are just beautiful and I am so thrilled that they bring you such happiness. They just look like they belong in your lovely home!! Your Pixie-Bobs are just beautiful! They look like they are best of friends. I feel the same way about pets ....they really do help us out in times of stress and sadness. Unusual markings, they look like leopards. My cats are the very best company whether I'm happy or sad. So cute! I always wanted to have a cat, I love how cats enjoy being in a garden, cats and garden go together, isn't that so?... and by the way, talking about gardens, the house in the roses is sponsoring a garden party and would love to see you participate. Come and see, and show us what's growing in your garden! Love your kitties!!! DH and I have a rescue cat named Princess Posey! She definately fits the Princess status! This past week we have both been sick, and she has been kept busy running across the end table between our two recliners, to see who needs her kisses and cuddles the most :^). She cannot walk from point A to point B on the floor...she has to trundle over any piece of furniture (or body) available to get where she is going. She is endless entertainment! Thank you for such a wonderful blog. What a pretty garden you have! And those cats are so beautiful. 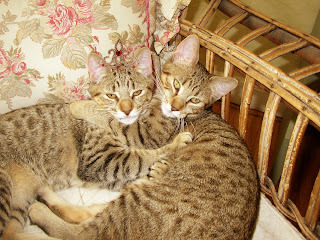 My friend has two bengal (sp?) cats and they are beautiful too. omgoodness.. your kittens are so adorable! Ive never heard of Pixie bobs before, but my daughter says she has. they certainly are beautiful! I love cats and yours are adorable! Cats are so cute when they curl up together aren't they? This is the first time I've heard of pixie-bobs. I can see why you love them. Right now we are having a much needed rainfall. I hope it lasts for awhile. Your cats are adorable!!! Cats are like furry little angels on earth! They love you unconditonally! !